Smoothies are the ultimate refreshing drink. And these New Jersey spots offer fruit, veggie, and protein packed smoothies, some with so many options to choose from that you’ll have to visit more than once. A few of these excellent smoothie places also allow you the flexibility to customize your smoothie and add in health-boosting shots to better suit your flavor preferences and health needs. Here are the 10 best in the state! Juice Caboose serves a massive number of juices, smoothies, and shots as well as healthy sandwiches, salads, and soups. Smoothies can be customized with your choice of base, including apple juice and soy milk, to suit your health preferences. Awesome options include Blue Velvet, which is made with strawberries, banana, and blueberries, Aloha Hawaii, made with pears, mango, lemon juice, and apple juice, and for a boost, Coco Java, incorporating fat free yogurt, coffee, milk, and coco java. Green Point Juicery offers an abundance of healthy options that will keep you feeling your best this summer and throughout the year. They offer both specialty and premium smoothies such as apple pie, which is made with apple, banana, kale, honey, nut milk, and cinnamon. Another yummy option is their Choco-Craving, incorporating raw cacao, banana, spinach, strawberry, vanilla, honey, and nut milk. Their menu also features cold pressed juices, immunity boosters, and superfood boosters. Everything on the menu is 100 percent non-GMO and organic. Manhattan Juice Bar & Café serves smoothies and fresh pressed juices as well as numerous other clean food options. Seven different protein smoothies in three sizes are available on the menu. You’ll find the Statue of Liberty, which includes avocado, honey, almond milk, and protein powder. Another power packed smoothie is the Penn Station, incorporating bananas, peanut butter, almond milk, and chocolate protein powder. They also serve juices, wraps, salads, and quinoa bowls. Enjoy a healthy treat so that you can maintain looking and feeling your best with a range of healthy juices and smoothies. There are three smoothie options available including the delectable salted caramel, which incorporates banana, dates, maca, sea salt, almond milk, and agave. Other options include pina colada, Creamsicle, chocolate covered strawberries, and a few green smoothie options. They also offer a create your own smoothie, where you can select four fruits or vegetables and the base ingredient of your choice. Arlee’s focuses on raw blends of juices, milks, nuts, and vegetables to create health-packed drinks. Many options available are packed with super foods and made with organic produce. One such smoothie that is pre-packaged and ready to take with you is made with strawberries, dates, chia seeds, cacao nibs, almonds, cinnamon, and vanilla. Stop by their store to pick up pre-packaged juices and salads to create a full meal. Evergreen Fine Fresh Foods has been serving healthy foods and drinks since 1995. Juices, smoothies, shots, salads, and sandwiches are available on their menu including banana split, Muscle Power, Hawaiian Blizzard, and True Blue. One option, Live Green, includes apple, orange, strawberry, pineapple, kale, spinach, and coconut water. Don’t forget to go green by skipping the straw when you order your healthful smoothie at Nature’s Blendz. A smoothie example is honeyed mango blatz, which includes mango, banana, almond milk, and agave. In any smoothie, you can also choose to add in protein, chia, or other boosters. Nature’s Blendz also serves sandwiches, wraps, and salads. 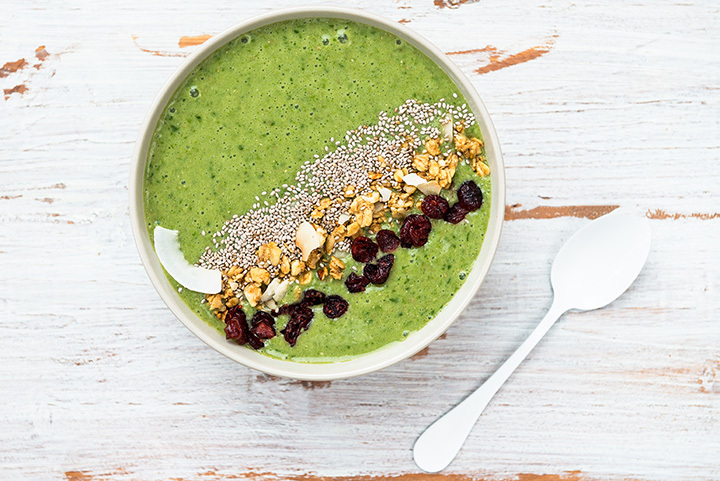 Enjoy smoothies and smoothie bowls at Juice Culture in Montclair. This cool spot with both indoor and outdoor dining space is a great place to relax with family and friends while enjoying a healthy treat. A stand-out smoothie blend on the menu is The Greg, made with cold brew coffee, soy milk, banana, peanut butter, cacao, dates, raw honey, and ice. Smoothie bowls are also yummy, healthy meal options and include those made with the super food acai. Green Nectar Juicery is an organic, vegan, 100 percent organic, and gluten free establishment that serves great smoothies. Smoothie options include basic berry, which includes coconut water, banana, strawberries, and blueberries, coffee crush, and Hawaiian dream. In addition, they also offer a create your own option and their working on new flavors all the time. The Market Place provides juices, salads, and sandwiches to encourage healthy eating. There are three smoothie options available on the menu including Vitamin C, made from pineapple, orange, banana, orange juice, and coconut water, which is great for fighting colds. Other options are Very Berry and PB&J. Other options include fresh juices, salads, and sandwiches.